Accueil → List → #JeFaisMtl: OnRoule listed as a project! #JeFaisMtl: OnRoule listed as a project! Catherine Blanchette-Dallaire posing for Je fais Montréal. What is “Je fais Montréal” ? 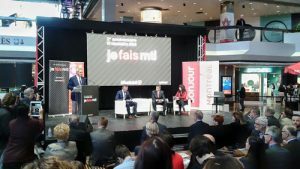 “Je fais Montréal“ is an approach to support, provide and make realisation easier of the 181 commitments taken by Montréalers leader from all horizon. The movement is to enhance Montreal “by implementing creative activities”. The projects have two major classifications; the lever and target ecosystems which consists of sub-categories. OnRoule.org is in the category of “Montreal, city of goodwill”, which is under the target ecosystem. This ecosystem includes all projects aimed to give “organize knowledge, how to do something and networks to better take care of us.” OnRoule fits perfectly with this philosophy by it’s mission and it’s objectives. 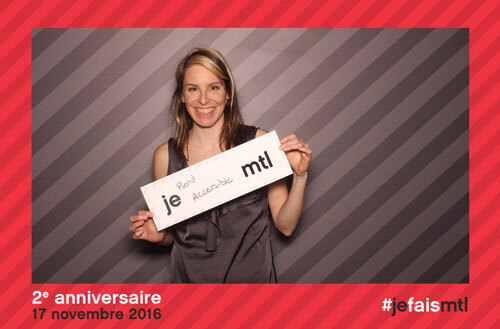 Elected people, innovative project representative and others are doing a tribute to Je fais Montréal.